For other uses of "voivod", "voyevoda", etc., see Voivod (disambiguation). Voivode (/ˈvɔɪˌvoʊd/) (Old Slavic, literally "war-leader" or "war-lord") is a Slavic title that originally denoted the principal commander of a military force. It derives from the word vojevoda, which in early Slavic meant the bellidux, i.e. the military commander of an area, but it usually had a greater meaning. In Byzantine times it was used to refer to mainly military commanders of Slavic populations, especially in the Balkans. In medieval Serbia it meant a high-ranking official and before the Ottoman conquest the commander of a military area. During Ottoman times, Voivode was the title borne by the ruler of a province, whose powers included the administration, security and tax collection under a special regime. According to the chronicle of the Voutsas monastery, the Slavic title of “voivode”, which prevailed in certain areas of Epirus and Thessaly before the Ottoman conquest, used to denote the leader of a Vlach community or family. The same title was borne by the Ottoman official who oversaw the “Chora Metzovo” each time. The word gradually came to denote the governor of a province. The territory ruled or administered by a voivode is known as a voivodeship. In the English language, the title is often translated as "prince" or "duke". In Slavic terminology, the rank of a voivode is considered equal of that of a German Herzog. A Voivode was often considered to be an assistant of the Knyaz. During military actions the voivode was in charge of a conscripted army that consisted of the local population, the voj (voi); while the knyaz had its own regular military formation, the druzhina. Today in Poland the term wojewoda means the centrally appointed governor of a Polish province or voivodeship (Polish: województwo). The Polish title is sometimes rendered in English as "palatine" or "prince palatine", in charge of a palatinate. Other similar titles could be considered Margrave (Frontier-Governor), Governor-General, and others. With the expansion of the Russian Empire the title of voivode was superseded by namestnik (compared to viceroy). The title was used in medieval Bulgaria, Bohemia, Bosnia, Croatia, Serbia, Macedonia, Greece, Wallachia, Moldavia, Transylvania, Rügen, Lusatia, Poland, Muscovy (later Tsardom of Russia), Halych, Volhynia, Novgorod Republic, Chernigov, and Kiev. Later, voivode was the highest military rank in the principalities of Montenegro and Serbia, and in the Kingdom of Yugoslavia. In the Romanian medieval principalities of Moldavia and Wallachia, voievode became part of the official titulature of the sovereign prince, showing his right to lead the entire army. Voivode or vajda (Baida) was also the title of the Hungarian governors of Transylvania in the Middle Ages. Baida was a title of a Ruthenian nobleman Dmytro Vyshnevetsky, a Cossack leader. Similarly, the rebel leaders in the Balkans were called voivodes. The term derives from Slavic voi or vojsko (militia) + vodi (to lead), and thus originally meant warlord (see Voyi). The word has developed to take various forms in the modern Slavic languages, such as "vojvoda" (Slovak, Slovene and Croatian), 'wojewoda (Polish), воевода (voyevoda, Russian), войвода or воевода (voyvoda, voevoda, Bulgarian), воєвода (voyevoda, Ukrainian), vévoda (Czech) and војвода (vojvoda, Serbian and Macedonian). It has also been borrowed into some non-Slavic languages, taking such forms as voievod (Romanian), vajda (Hungarian) and vaivads (Latvian). Voivode is also related to state formations such as Vojvodina, Polish provinces voivodeship, and medieval provinces of Balkans. This etymology is perfectly parallel, though unrelated, to that of equivalent Germanic titles and terms like the Old English heretoga and the German Herzog, which in feudal times was equated with the Latin dux (originally a term for either a barbaric war leader or a Roman commanding officer or military governor, which later evolved into such feudal and modern titles of peerage rank as duke). For this reason, the Slavic terms are sometimes translated as duke. However, although in some countries and periods the rank of voivode was equivalent to a Western duke, it was not universally so. The tradition of electing a voivode is very old and dates back to the times of the early Slavs. Each tribe gathered at a veche (congregation) to elect its own voivode. In war, he was entitled to lead the army. When the war was over, the power reverted to the legitimate peacetime ruler — be it the veche or a prince. By the end of the 8th century, the Slavic tribes established the first organised states in Central and Eastern Europe. The new situation demanded a more flexible command over the state, especially during the conflicts with Turkic, Baltic and German peoples. At that time, the power of the voivode was in most cases extended to include civil command and, in some instances, to religious authority. The chiefs of the tribes, princes and hospodars, delegated part of their authority to lower-ranking voivodes, while retaining the title of highest voivode and the positions of high priest and supreme judge. With the creation of permanent Slavic states in Kievan Rus', in Bohemia and Poland, the highest authority was passed to dukes and princes. In Kievan Rus', these came from the Varangian nobles (Rurik Dynasty), while in Bohemia (Přemyslids) and Poland (Piast Dynasty) they were of local origin. The basis of the power of a prince was his band of warriors or druzhina. Initially a small group of professional soldiers, the druzhina grew in order to control the vast areas under authority of the prince. In time, the need to split the army into several units became clear and the commander of such a unit was called prince's voivode. The highest ranking of such voivodes formed the princes' courts, while others commanded the troops in distant towns and served as advisors to the prince's delegates. In medieval Russia voyevoda was the governor of a border fortress or town. The rank was abolished by Peter the Great in the mid-18th century. In modern Poland, a voivode (wojewoda), appointed by the central government in Warsaw, is the governor of a voivodeship. Each voivodeship also has an elected assembly, called a sejmik, and an executive board elected by that assembly, headed by an official called the marszałek meaning marshal. For a summary of the respective competences of these authorities, see Voivodeships of Poland. The office was created in the Kingdom of Poland under the Piast dynasty in 960 AD, and from the Crown of the Polish Kingdom spread to the Grand Duchy of Lithuania after 1569, as an overseer of a voivodeship and its administration. In time, the office lost some of its importance — from "second after the ruler" to just one of several dozen important officials. In the Polish–Lithuanian Commonwealth, a voivode was one of the officials entitled to sit in the Senate of Poland. 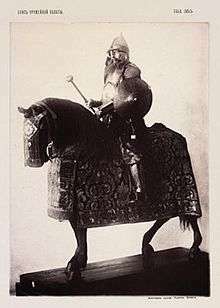 The Voivode of Transylvania was one of the barons (or chief office holders) of the Kingdom of Hungary. The voivode, in effect, a territorial governor or viceroy appointed by the Hungarian Crown. He was also the chief magistrate and military commander of the Transylvanian counties, whose heads, or ispáns, were appointed and dismissed by the voivodes, instead of the sovereign. The voivodes, closely affiliated with the kings, were often far from Transylvania, and local administration frequently fell into the hands of the vice-voivodes. Some voivodes, such as Ladislaus Kán, were powerful local rulers, effectively independent of the king. The title was in use from 1167 until the Principality of Transylvania emerged in the 16th century. In Moldavia and Wallachia, Voievod meant the same thing as Domn (lord), which was the supreme administrative leader - a term stemming from the Latin word dominus, meaning lord or master. Both titles (and the associate offices) went by default to the ruling prince, which - as a sovereign ruler - had all land in allodium and was the chief commander of the army. The voievod title was kept in its initial form by the Wallachian (Romanian) nobility of Țara Hațegului and Maramureș, where the title of voievod, together with the princely cneaz title, had the meaning of noble or local ruler, but also leader of local armies or militias. The last person in current-day Romania to bear the voivode title is Michael I of Romania. Between 1930 and 1940 he had the formal title of "The Grand Voivode of Alba Iulia", a reference to prince Michael the Brave (1593–1601). Voyevodas (Russian: воевóда, plural form: воевóды) in Russia were the appointed administrators responsible for the regional administration, initially in charge of some military unit that defended the region (usually uyezd), in the late 16th – early 18th centuries. The title has a close similarity with the Margrave of the Holy Roman Empire, meaning the ruler of border territories (see Mark). The title of voyevoda became more regular from about 1550 and was divided between Regimental and City Voyevoda. Voyevoda (singular) was appointed by the Tsar's Prikaz and confirmed by the Boyar Duma (the advisory state institution to tsar) for the length of two to three years. At first that position was assigned to the administrators of border territories and was similar to the later Russian Governorate-General. As the territory of the Russian State expanded the position was somewhat degraded for the territories that drifted away from the international borders. The voyevodas filled a power vacuum left by the Time of Troubles. The early Romanovs (1613–82) gave all their judicial and police powers to the voyevodas in an attempt to reform them, but problems remained, as their powers became too broad and invited corruption. In 1621, the voyevodas were forbidden by Tsar Michael to take bribes as this had become a problem. Despite this, the administration remained chaotic until Peter the Great's reforms replaced the voyevodas with Burgmesters (Burgomasters, after the German) to collect the taxes. From about 1550, a Russian Voyevoda was an official with both civil and military powers. He was originally a military commander but on the frontier, civil and military could not easily be separated. The first peace-time voyevoda (in place of the older urban Namestnik and rural Volostel) was probably that of Murom in 1547 facing the Kasimov Khanate. As Russian frontier expanded, by the 1570s and 80s voyevodas appeared at Kazan, Astrakhan, Kaprivna, Rylsk, Arkhangelsk, Voronezh and other places. Since the earliest Russian entry, Siberia was administered by voyevodas. They were appointed to each significant town by the special Siberian Prikaz usually for a term of two years. Towns and voyevodas were grouped into razryads under a principal town. Originally this was Tobolsk for the whole of Siberia. Tomsk was split off in 1627, Yakutsk in 1638 and Yeniseisk was separated from Tomsk in 1676 or 1677. Verkhoturye, which was the chief Siberian customhouse, was its own razryad from 1687 to 1693. A voyevoda would sometimes have an assistant voyevoda or a pismenny golova ("writing head" or scribe). The term golova ("head", without the pismenny) appears in English sources with an uncertain meaning. A prikazshchik was a sort of sub-voyevoda who was given special powers. Increasingly, there were Dyaks, a sort of high clerk who supplemented a voyevoda in administrative affairs. Valid documents had to be countersigned by the Dyak. This collective administration was designed to prevent corruption. Below the Dyak was the Podyachy or underclerk. These were often local men who might hold office for decades. 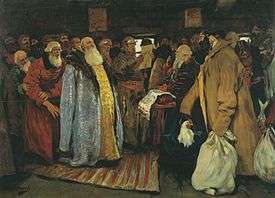 At certain periods of Russian history, financial affairs were managed by tselovalniks or sworn-men and kept somewhat separate to reduce corruption. During the Middle Ages, the vojvoda was a military rank and a noble title. veliki vojvoda was bestowed upon the top generals. In 1691, the Serbs who lived in the Habsburg Monarchy (now Vojvodina province in northern Serbia) gained from the Habsburg emperor the right to territorial autonomy within one separate voivodeship in the Habsburg Monarchy, as well as right to be ruled by a Serb voivode - a civil and military administrator. However, the voivodeship was not formed at that time, nor was a voivode appointed, only a vice-voivode. Jovan Monasterlija was the vice-viovode of the Serbs between 1691 and 1706. After him, no other vice-voivodes were appointed. At the May Assembly in Sremski Karlovci (May 13–15, 1848), recalling the privilege from 1691, the Serbs proclaimed the creation of the Serbian Vojvodina and elected Stevan Šupljikac as voivode. 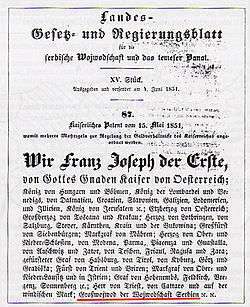 These actions were later recognized by the Austrian emperor, and Šupljikac was recognized as a voivode. By a decision of the Austrian emperor, in November 1849, a new province was formed as the political successor of the Serbian voivodeship. It was known as the Voivodeship of Serbia and Temes Banat. The new voivodeship existed between 1849 and 1860 and the title of great voivode (Grosswojwod) belonged to Emperor Franz Joseph I of Austria himself, though it was ruled by an appointed governor. After the voivodeship was abolished in 1860, Franz Joseph I kept the title of great voivode of the Voivodship of Serbia until his death in 1916. His successor, Karl I of Austria, also retained the title until the end of the monarchy in 1918. The title was often used to designate important military commanders in the Serbian Uprising against the Turks 1804-1815. In the period from 1903-1918 the Serbian paramilitary organisation Chetniks used the title internally to designate its top commanders - Vojin Popović, Voja Tankosić and Kosta Pećanac being the prime examples. It was used in this manner again by the Chetniks in the Second World War. Field Marshal (Serbian: Бојни Војвода or etymologically; English: Battle Warlord) was the highest rank in the army of the Kingdom of Serbia and Kingdom of Yugoslavia until Second World War. It was created with the passing of the Law on the Organization of the Army of the Kingdom of Serbia in 1901. Law was passed on the suggestion of Lieutenant colonel (later Divisional General) Miloš Vasić who was Minister of the Defense at the time. The rank was awarded only during the war for Particular military contributions of top generals. In the Balkan Wars and World War I this title was used to designate the highest military rank in Serbian Army (above the General - equivalent to Field Marshal in other armies). The first Field Marshal (Vojvoda) was promoted by the Great military decree of the Kingdom of Serbia on 20 October 1912. Only four people ever officially held that military rank: Radomir Putnik (got it in 1912), Stepa Stepanović (1914), Živojin Mišić (1914) and Petar Bojović (1918). Honorary title but not military rank held Montenegrin General Janko Vukotić (1915) and French General Louis Franchet d'Espérey (1921). During the World War I, General Petar Bojović held the position of Chief of Staff of the Supreme Command (the highest military position in the Serbian Army) and was a superior to two army commanders who were field marshal's (Stepa Stepanović and Živojin Mišić). In Bram Stoker's Dracula (Chapter 3), as Count Dracula recounts his genealogy to Jonathan Harker, he claims that the voivode who "crossed the Danube and beat the Turk on his own ground" was a Dracula. In Chapter 18, Van Helsing speculates that this was Count Dracula himself. Among Russians, there are at least three significant works involving voivodes. Tchaikovsky's first opera, Voyevoda, Op.3, was based on Alexander Ostrovsky's play. Tchaikovsky's later orchestral work, the symphonic ballad The Voyevoda, Op.78, was based on Alexander Pushkin's translation of Adam Mickiewicz's poem. It has the same name as the opera but is otherwise unrelated to it. Anton Arensky later produced his own operatic adaptation of the play as A Dream on the Volga. Rimsky-Korsakov's differently sourced opera Pan Wojewoda, while composed to a Russian text, is set in Poland. In the video game Metal Gear Solid 3: Snake Eater, The Boss is also known as Voyevoda by the Soviets, as referenced in the game by President Johnson. Leaders of the Tzimisce clan in White Wolf's Vampire the Masquerade may be known as Voivodes due to their Slavic origins. ↑ Also spelled "voievod", "woiwode", "voivod", "voyvode", "vojvoda", or "woiwod"
↑ Bjelajac 2004, p. 15. Bjelajac, Mile (2004). Generali i admirali Kraljevine Jugoslavije 1918—1941. Belgrade: Institut za novu istoriju Srbije. ISBN 86-7005-039-0. Franz Ritter von Miklosich (1886). Etymologisches Wörterbuch der slavischen Sprachen. W. Braumüller. p. 393. Konstantin Jireček; Vatroslav Jagić (1912). Staat und gesellschaft im mittelalterlichen Serbien: studien zur kulturgeschichte des 13.-15. jahrhunderts. In Kommission bei Alfred Hölder. M. Kokolakis, “Mia autokratoria se krisi, Kratiki organosi-Palaioi Thesmoi-nees prosarmoges” [An Empire in Crisis: State Organization – Old Institutions – New Adjustments], in Istoria tou neou ellinismou, Vol. 1, publ. Ellinika Grammata, Athens 2003, p. 49. Chisholm, Hugh, ed. (1911). "Voivode". Encyclopædia Britannica (11th ed.). Cambridge University Press.